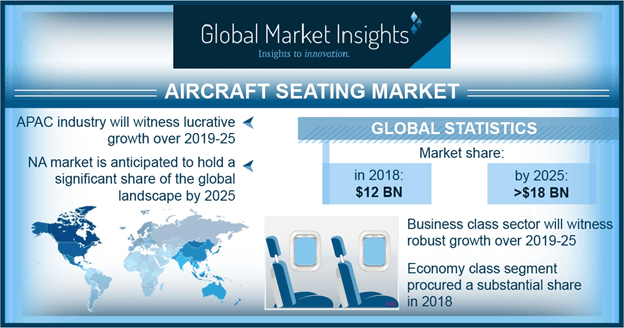 Aircraft Seating Market size is estimated to exceed USD 18 billion by 2025; according to a new research report by Global Market Insights, Inc.
Increasing aircraft demand owing to rising air passenger traffic across the globe will drive the aircraft seating market. Airliners are upgrading their aircraft fleet and introducing new routes to cater to the leisure and corporate travelers. Advancements in seats along with enhanced ergonomic designs are contributing significantly towards improving the air travel experience. Additionally, major airliners are focusing on utilizing maximum space in their aircrafts by optimizing legroom to accommodate high number of passengers. Reduction in aircraft weight contributes significantly towards improving the operational efficiency of the airliners along with minimizing carbon emissions considerably. For instance, according to the International Air Transport Association (IATA), aircraft manufacturers along with airliners announced their strategic plans for improving average fuel efficiency of around 1.5% per year from 2009 to 2020. Additionally, the incorporation of advanced materials and technologies for manufacturing lower weight seats are further expanding the market share over the study timeframe. Industry participants are engaged in strategic collaborations and partnerships with airline operators for introducing technologically advanced seats for air passengers. For instance, in 2017, Acro entered into a partnership with Airbus and Air New Zealand for developing an advanced economy class seat for the A320 & A320neo aircraft fleet. These are equipped with reconfigurable seat technologies with curved setback, allowing for improved seat pitch and improved legroom for passengers. Technological advancements in aircraft seats including the integration of sensors in seats for enabling passengers to adjust their seat position with applications and software are providing a positive outlook for the aircraft seating market expansion. The slim profile of seats enables aircraft manufacturers to reduce the overall weight along with improving legroom space. For instance, in February 2019, Hubert designed a new seat for Airbus that analyzes data and adjusts the seat to fit the ergonomics of passengers automatically. Narrow body aircraft seating market share is expected to witness highest growth rate over the forecast timeframe. This growth can be attributed to the increasing demand for low cost air carriers across the globe. Additionally, the higher fuel economy and operational efficiency along with improvements in fuel tanks and higher wing load capacities further accelerates the segment demand over the study timeframe. Economy class dominates the market owing to the requirement for higher number of seats in such aircrafts for accommodating passengers. Additionally, these seats are equipped with advanced features including extended headrest wings, magnetic meal tray, and automatic control of seat temperature and movement, contributing significantly towards improving the passenger travel experience. Moreover, lower air fares along with the availability of a vast network of flight routes further accentuates the industry share over the study timeframe. Retro fit accounted for a considerable share in the aircraft seating market. Increasing upgradation and modification of aircraft cabins for enhancing air passenger experience are supporting the market expansion. For instance, in January 2019, Mirus Aircraft Seating announced an agreement with TUI Group to provide seats for its airlines operating in UK, Belgium, and Netherlands. The redesigning of first-class seats with additional features such as cup holders and entertainment systems are expanding the market size over the projected timeframe. North America aircraft seating market will showcase significant growth over the forecast timeframe owing to high concentration of aircraft manufacturers across the region. Aircraft manufacturers are continuously investing in their manufacturing facilities for expanding aircraft production to meet order backlogs. For instance, in January 2019, Boeing announced the delivery of 806 aircrafts compared to 763 aircrafts in 2017. The major industry participants in the market include Mirus Aircraft Seating, Geven, Recaro Aircraft Seating, HAECO, Lufthansa Technik, and Stelia Aerospace. The other key players include, Safran, Collins Aerospace, JAMCO, Zim Flugsitz, Expliseat, Embraer Aero Seating Technologies, and Iacobucci HF Aerospace. Partnership with aircraft manufactures and airliners is the key strategy adopted by industry participants to enhance their market share. For instance, in April 2018 Recaro Aircraft Seating announced a partnership with Gol Airlines to provide economy class seats for 86 aircrafts.